Cecil’s bother, Kirk, took the MissionFOTO crew on a tour of Long Beach and Gulfport. In Gulfport, we visited his brother-in-laws house where we found that 7 ½ feet of Gulf water had invaded their home, destroying nearly the entire building and all the contents. The family photos had been placed in a closet on a shelf…a shelf only 6 feet above the floor! 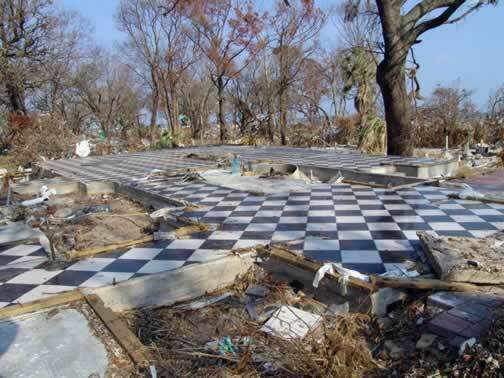 In Long Beach, he took us to his sister’s home where only the slab floor was remaining. The building and contents were broken and twisted two blocks away along the railroad tracks. The nephew’s piano lay in the street crumpled a block away.